Chris Cecil-Wright calls to say he's now set up a new brokerage company called Cecil Wright & Partners and has signed the 55.5m Issana as his first central listing. Previously a Partner and Director of Edmiston & Company, Cecil-Wright will provide a bespoke yacht match-making service for clients seeking perfection. With over 20 years experience and a hand-picked team of experts, he is confident of the potential for growth in this market. And now, more about Issana. Built by Feadship in 2005, refitted in 2009 and formerly known as Drizzle, she features an interior in subtle, classic luxury by Redman Whiteley Dixon accommodating 10 guests in a master suite, three double staterooms and a twin cabin. Twin 1520hp Caterpillar engines give her a transoceanic range and she’s been fitted with zero speed stabilisers. 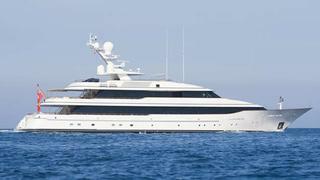 Lloyds classed and MCA compliant, Issana is asking €34.95 million.